Released in 2003, Elf was a critical and commercial success earning over $200 million at the box office. The title role of Buddy, expertly played by Will Ferrell, towers over his fellow elves with the help of some forced perspective camera work. Jim Carrey was the original choice for Buddy, but ultimately Ferrell was selected. Buddy’s solo song at Gimbels was totally improvised by Ferrell. His slapstick comedy is sure to draw laughs even from the toughest viewers. Santa’s biggest helper made a big impression with audiences and continues to impress viewers today. 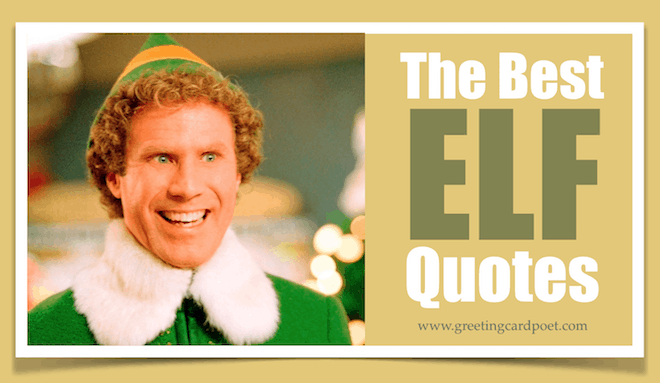 These elf quotes will help you recall some of the funnier moments from this classic. Us elves like to stick to the four main food groups. Candy, candy canes, candy corns and syrup. This place reminds me of Santa’s workshop. Except it smells like mushrooms and everyone looks like they want to hurt me. First, I went through the seven levels of the Candy Cane Forest. Then, I went past the twirly, swirly gumdrops. And after that: I went through the Lincoln Tunnel. I just like to smile! Smiling’s my favorite. First we’ll make snow angels for 2 hours, then we’ll to go skating, then we’ll eat a roll of Tollhouse cookie dough as fast as we can, and then to finish, we’ll snuggle! Is syrup made of sugar? Then yes! 11. My finger has a heartbeat. 12. That’s another thing… Buddy you should know that your father… he’s on the naughty list. 13. Santa! Oh my god! Santa’s coming! I know him! I know him! 14. I’m singing! I’m in a store and I’m singing – I’m in a store, AND I’M SINGIIIIING! 15. Gimbels Manager: Hey! There’s no singin’ in the North Pole! Gimbels Manager: No there’s not. Buddy: We sing all the time! Especially when we make toys! 16. Have you seen these toilets? They’re GINORMOUS! 18. This place reminds me of Santa’s Workshop! Except it smells like mushrooms and everyone looks like they want to hurt me. 20. I’m a cotton-headed ninny-muggins. 21. It’s just nice to meet another human that shares my affinity for elf culture. 22. Francisco! That’s fun to say! Francisco. Francisco. Franciscooo. 23. I think you’re really beautiful and I feel really warm when I’m around you and my tongue swells up. Check out Christmas Jokes and Puns. 24. The best way to spread Christmas cheer is singing loud for all to hear! 25. I thought maybe we could make ginger bread houses, and eat cookie dough, and go ice skating, and maybe even hold hands. 26. Nice purple dress. Very purpley. 27. I’m sorry I ruined your lives, and crammed eleven cookies into the VCR. 28. Deb, you have such a pretty face, you should be on a Christmas card. 29. There’s room for everyone on the “Nice List”! Note: Many of these elf quotes are so well known, they become part of our everyday language during the Christmas season. Don’t believe us? Pull out some maple syrup at the breakfast table in December. When the first Elf script emerged, folks were lining up Jim Carrey to play the role of Buddy. Ferrell reportedly turned down an offer to play Buddy in Elf II which would’ve made him $29 million. The tiny elves were not made with special effects. A “forced perspective” filming technique was used to make them appear smaller relative to Will Farrell’s Buddy. Remember Ralphie from A Christmas Story? He has a cameo role as Ming the elf in the movie. Will Farrell was once a mall Santa. I passed through the seven levels of the Candy Cane forest, through the sea of swirly-twirly gum drops, and then I walked through the Lincoln Tunnel. Have you seen these toilets? They’re ginormous! You smell like beef and cheese. You don’t smell like Santa. (Phone Rings…and Buddy picks up) Buddy the Elf, what’s your favorite color? Watch out! The yellow ones don’t stop. You’re on Elf Quotes page.